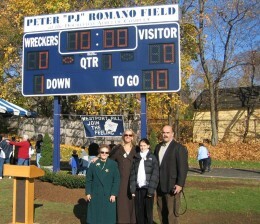 The football field was named in honor of Peter "PJ" Romano. enjoyed their athletic experience through Westport P.A.L. the WPAL Christmas Party, the Special Olympics each April and more recently, the WPAL Ice Rink at Longshore. Among those who participated in the ceremony were Westport First Selectman Diane Farrell, who initiated the idea of dedicating the field, along with Police Chief Al Fiore and Parks and Recreation Department Director Stuart McCarthy. the achievements and dedication of PJ Romano. oversaw the annual PAL Halloween Parade and Christmas Party community events. Romano and his son, Peter T. Romano, were among the YMCA’s Faces of Achievement honorees in 1998. ​A longtime member and past president of the Westport Sons of Italy, Romano was honored as, Westport’s Volunteer of the Year and received a citizenship award from the Sportsmen of Westport.